These days, we’re all very used to trailers featuring a lot of material that never actually makes it into the final theatrical cut of a movie. Notable recent examples include Rogue One and Suicide Squad. Now, we can add Spider-Man: Homecoming to that list, as the film’s director, Jon Watts, has revealed that the finished cut is missing some memorable moments from its promotional campaign. Unlike those other films, though, this one didn’t need extensive reshoots. Instead, certain scenes were simply never meant to be part of the movie. Speaking to Screen Crush, Watts explained the origins of the trailer sequence where Vulture swoops down towards the camera in a hotel atrium. “The hotel atrium shot was originally created for Comic-Con, for like a sizzle reel before we had really shot anything; we had shot like two weeks of footage or something. That was never meant to be in the movie. But I did use that angle for Vulture’s reveal at the beginning of the movie; Vulture’s hovering, swooping towards the camera like that. I used that shot, it’s just no longer in an Atlanta hotel atrium. The second example of a scene that was made for the trailers and not the actual movie is even more surprising. You know that punch-the-air moment showing Spider-Man and Iron Man teaming up as they fly through Queens? Yep, that isn’t in the film, either. 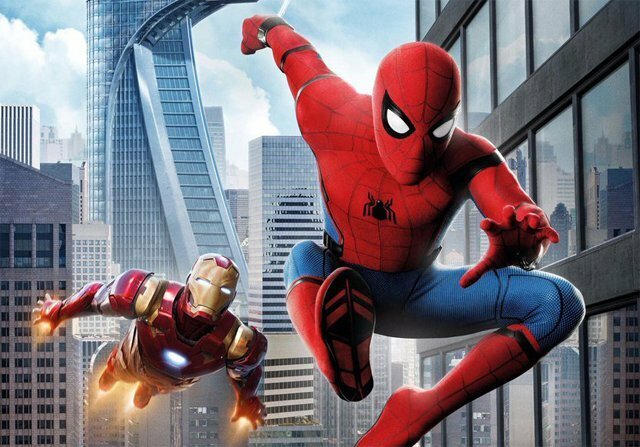 “And the shot of [Spider-Man and Iron Man] in Queens, that was never in the movie… I think what happened was in the very first trailer they wanted a shot of Spider-Man and Iron Man flying together. And they were going to use something from the Staten Island Ferry [scene], but it just didn’t look that great — the background plate, because the Staten Island terminal is a very simple building. It almost looks like an unrendered 3D object. It’s a big shame that there isn’t an awesome team-up shot in the movie, though we still have lots of Spidey/Shellhead goodness to enjoy. Now that the webhead exists in the MCU, the studio is making the most of the opportunity by having him buddy up with, let’s face it, the king of the Marvel Cinematic Universe. Spider-Man: Homecoming has already arrived in UK cinemas and will land in US theatres tomorrow, July 7th.